Today is the second day where we are featuring the individuals who entered the 2015 Life of an Architect Playhouse Design Competition and had their playhouse submissions selected from hundreds of spectacular entires submitted for consideration. This week we will take an up close and personal look at each of the three winning playhouse entries and the designer behind them. 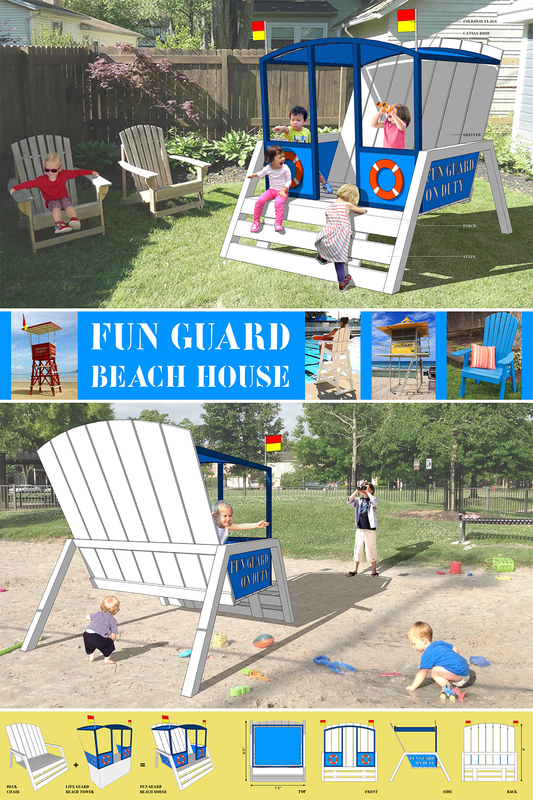 Today we are looking at “Fun Guard Beach House” Playhouse Designer Susann Stein, who currently lives in Houston, Texas, USA, but has apparently lived just about everywhere. I studied Architecture in Germany, in Dresden and Leipzig. I am an Architect by training, especially interested in space planning and interior design. I just started a new job at an interior company in Houston. My portfolio is pretty diverse including healthcare projects in Germany, subway stations in Singapore, a train station upgrading in Australia and a hotel interior design in Malaysia. I found your competition while living in Malaysia. I was looking for exceptional playground designs online, because me, and especially my daughter, were bored by the public playgrounds in Kuala Lumpur. When I saw the call for entries for your 2nd Playhouse Competition I immediately started designing my first entry, only days before submission deadline in 2013. The first concept for the beach house I already had last year, but I couldn’t find the time to draw it up because of our relocation to the US. This year it took 2 weeks for refining the idea and getting it on paper. SketchUp for the model and iWorks Pages for the layout. The size. First it felt like designing a miniature house, so you have to downscale everything to kid’s size. But once I had a concrete idea it turned into the opposite: in the end it is ‘just a 8’ tall chair’. A kind of ‘Alice in Wonderland experience’. Not really. You just have to stay focused on the scale all the time and keep a measuring tape by your side. It also helped adding my kids to the perspectives and see how it would be if they climb up the chair. For this competition in 2013. It feels amazing! It is always great to see your design come to life. And knowing that this is not just for an exhibition to raise money for CASA but it will also be given to the kids afterwards feels very rewarding. I am grateful to all people involved in this competition, Bob Borson, the judges, the Mall and the builders. I think my very first idea was that I would like to combine a hide-out and a look-out. Then I saw some pictures of beach towers and life guard chairs, and the beach topic caught my very interest. Not as much as I’d like to. Usually the scale of competitions requires more than just me and my laptop. I like that this one is open, very creative and once you got an idea, quickly done. This is Susann’s original design submission that was evaluated during the judging rounds. This was another entry where the judges appreciated the “out of the box” thinking. A great many of the entries are literally boxes and to develop an evocative shape that still meets the judging criteria (creativity, appeal, originality, build-ability, and construction costs) is far more challenging that casual observers might appreciate. There was a lot of conversation centered around how this playhouse (which isn’t really a playhouse at all) might be perceived when put on display with all the others. Since it was selected as one of the winners, I think it is safe to say that the judges felt the design would be of great interest to the “target” demographic. This was a fairly straightforward design and the construction drawings represented it as such. The construction company who volunteered to build this playhouse were not particularly close to me (about a 2 hour round trip drive) so I relied on them to provide me with today’s construction photos. Clearly it was a family affair on the “job site”! I was pleasantly surprised to learn the mall where these playhouses are being displayed (the fantastic NorthPark Mall in Dallas) decided to use Susann’s Fun Guard Beach House as one of the images in their Instagram feed. It would appear that the judges this year – ALL 18 OF THEM – knew what they were doing. The handful of times I have been in the mall since the Susann’s Playhouse has arrived I’ve noticed that there were a lot of Dad’s hanging around … I’m sure that being across from Victoria’s Secret has nothing to do with that. Here is a picture of Susann with some of the contractors who worked on building her playhouse. I think it is terrific that they had a chance to meet one another – Susann told me that she found them very humorous – I find them to be terrific people for donating their time, skills and resources to make SUsann’s entry a reality. Unfortunately, I wasn’t able to make the opening reception this year, which was disappointing on many levels; not least of which was that I didn’t get to meet Susann in person (I feel like I know her well considering the number of emails we have written to one another!). However, for only the second time ever, one of the winning playhouse designers was able to attend – which made everyone very happy. Susann drove up from Houston and was able to represent herself and her playhouse during the opening reception and sent me the previous two pictures. She was even able to bring along her children (which I’m sure gave her terrific insight into what kids would like in a playhouse).